Captain Joe Root was quick to find form on day one of England’s first warm-up in the West Indies but a lower-order collapse offered a warning against complacency in Barbados. Root fashioned a fluent run-a-ball 87 against a CWI President’s XI, hitting 12 fours and two sixes to put a lean stint in Australia’s Big Bash League swiftly behind him. The Yorkshireman had a top score of 26 in his seven innings at the tournament but was a class above at the 3Ws Stadium, while Ben Stokes (56) and Rory Burns (35) each spent more than two valuable hours at the crease as the tourists finished 10 down for 317. Not everyone made the most of the workout and the evening session belonged to a home team boasting six internationals, England at one stage losing five wickets for 31 runs. 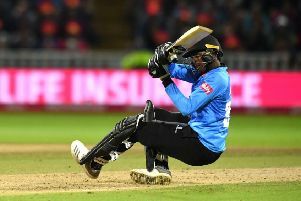 Opener Keaton Jennings had a strange day at the office, first man out for 10 when he popped Alzarri Joseph to short-leg, then summoned for a second chance late in the day. He returned after England lost their 10th wicket, a curiosity allowed by the flexible terms of this 12-a-side contest, and made an unbeaten 15. The game concludes today, when the bowlers have their chance to tune up for the series opener on January 23 on a pitch offering some assistance. As for Joseph, it was the first of two celebrations as news of his inclusion in the Windies Test squad broke during the morning session. The 22-year-old has not featured for his country since the day/night Test at Edgbaston in 2017, held back by a stress fracture, and bowled within himself in an appearance designed to help him along to full match sharpness. Jonny Bairstow’s stay was even briefer than Jennings’ first, off the mark with a streaky four then caught behind aiming a wild and wanton drive at Raymon Reifer. Burns and Root saw things through to 87-1 at lunch, the former conservative but in control while his captain quickly settled into a typically brisk innings. Having eased to 30 he took Chemar Holder for three boundaries in the first over of the afternoon, overtaking his partner along the way. Holder had Burns lbw soon after, though the Surrey man had banked valuable middle practice by then. Root added 69 in partnership with Stokes, the skipper effortlessly into his groove as he milked the seamers and punished the spin of Bryan Charles, who would go on to complete an unlikely five-wicket haul. A century, and likely retirement, appeared inevitable until a first real misjudgement cost him his wicket. A top-edged sweep gave Charles a much-needed breakthrough but Root’s failure to convert did not detract from a convincing knock. Stokes also helped himself to a half-century, the highlight of which was a crunching flat six off Charles, before a clatter of wickets. From 217-4, England slid to 248-9 in the space of eight overs. Moeen Ali and Stokes both donated their wickets to Charles with ugly shots, while wicketkeeper Jahmar Hamilton pouched three successive catches as Ben Foakes, Sam Curran and Jack Leach succumbed in short order. Stuart Broad became the 10th wicket to fall on 284 but that was not the end of the innings as Jennings made his second appearance of the day. Cricket Scotland has named Shane Burger as the new head coach of the men’s national team. Burger takes over in March from Grant Bradburn, who left the role late last year to take up an assistant coaching position with Pakistan. Burger moves to Scotland from South African first-class provincial side KwaZulu-Natal Inland where he has been head coach since 2015, leading the team to three trophies in that period. “I am both delighted and honoured to be awarded this position as head coach of Scotland,” said Burger. Burger was named Cricket South Africa coach of the year in both the 2015/16 and 2017/18 seasons and additional coaching roles have included assistant coach to South Africa A in 2016 and assistant coach at the CSA National Academy in 2017 and 2018. Malcolm Cannon, Cricket Scotland chief executive, said: “Shane impressed the selection panel not only with his skills and experience but also his passion for the role, his leadership capabilities and people management skills so we very much look forward to welcoming him on board.